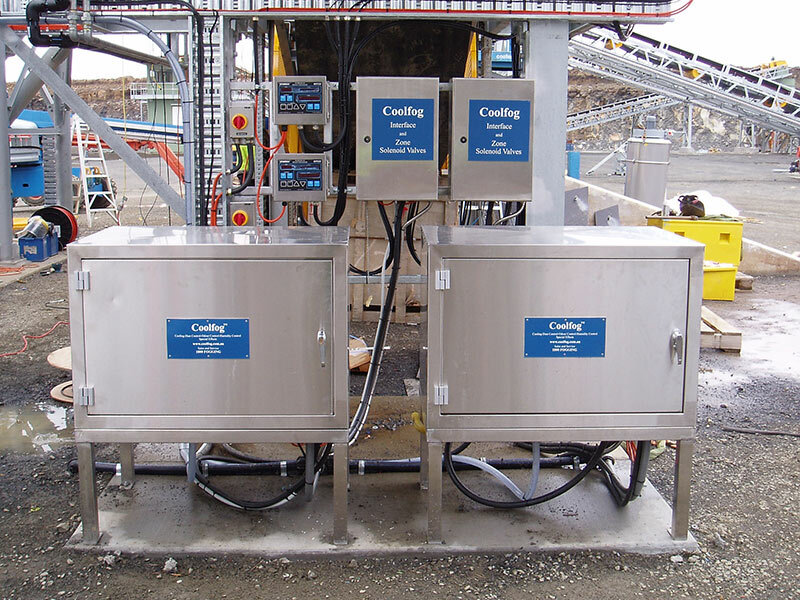 Access Environmental Systems offers new technology, providing solutions for temperature, dust and odour control throughout various industries. 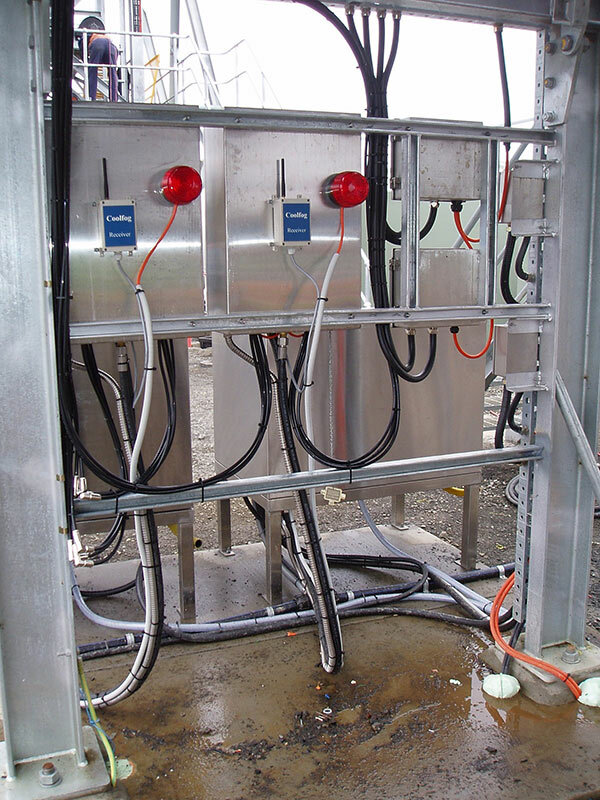 We design, manufacture, install, commission and service fogging system technologies. 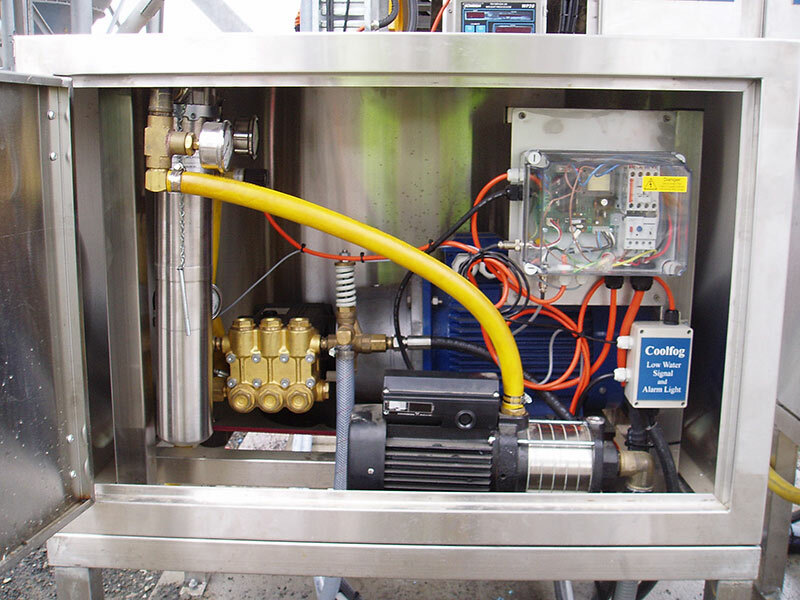 Coolfog systems pressurize water at 1000psi through nozzles designed to produce water droplet particles known as fog, which will evaporate into the atmosphere within seconds, thus reducing the surrounding temperature. This fog will also encapsulate and suppress any dust particles that may be present in the atmosphere whilst falling to the ground. 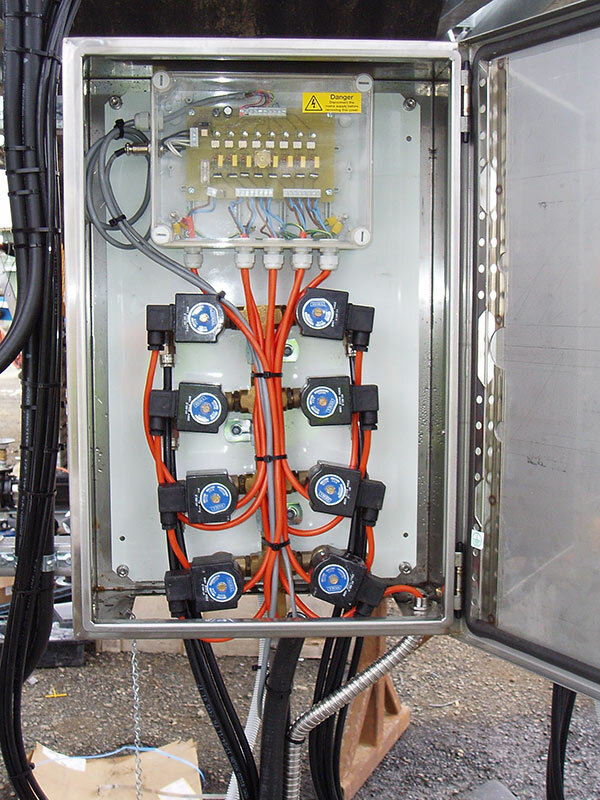 All Coolfog pump control modules are manufactured using stainless steel frames and covers and high quality non corrosive parts and fittings which are weather resistant ensuring long life allowing for internal and external installations. Nozzles are available in sizes from 0.2 mm up to 1.2 mm orifices, with flow rates from 0.07 to 0.483 l/min at 1000 psi. 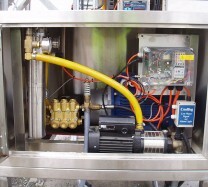 System designs are available with capacities from 10 nozzles up to 770 nozzles per pump control module. All the main, delivery and fogging lines are manufactured from nylon high pressure tubing, which is UV stabilized, flexible and simply pushes into special push fit nozzle couplings, tees and elbows which makes the Coolfog systems easy to install. The fogging lines that are suspended off the ground are usually installed by fixing to a PVC coated stainless steel catenary cable suspended the length of the building or directly to a fixed structure. 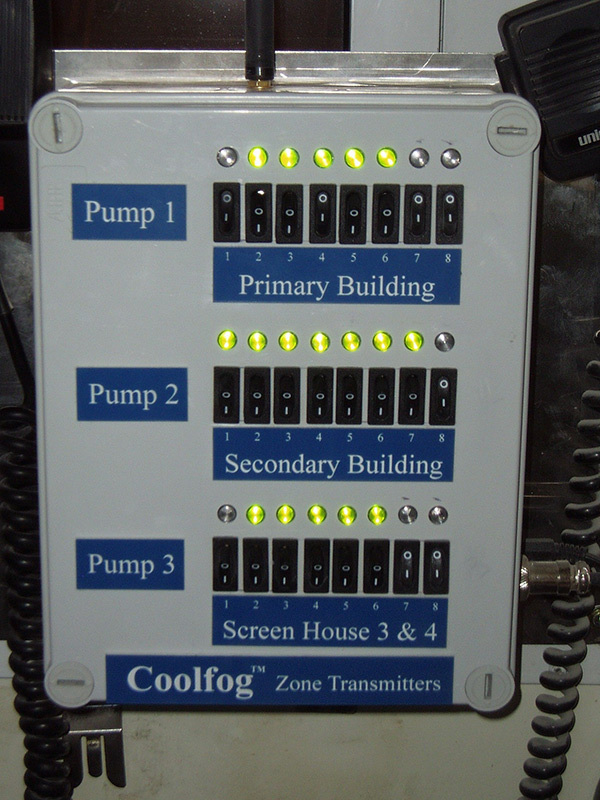 Independent tests conducted by Airlabs Environmental confirm Coolfog is highly effective in reducing airborne dust. 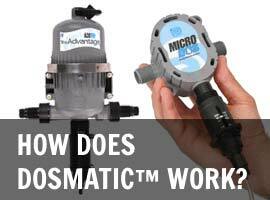 Particle sizes of 10 microns were reduced by 65.3%, while particles sizes of 2.5 microns were reduced by 79.2 %. Click here for Dust Suppression Results. 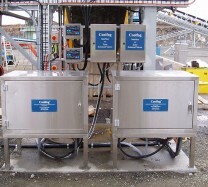 Click here for Odour Reduction Results. 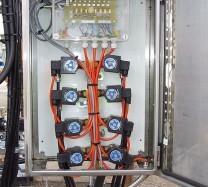 Easily adaptable to all production facilities and site applications. 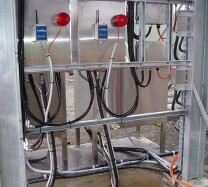 Highly efficient with client feedback reporting significant temperature, dust and odour reductions. Very economical on water consumption. 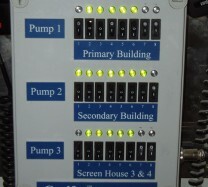 Can be used with mains, rain, bore, and creek or dam water. Will not block vibrating screens. Assists companies to comply with legislative requirements. Minimises the impact of dust and odours on neighbours. Improves the working environment and the company image.